In 1971, Alexander (Midland) exchanged its fifteen VRTs for fifteen Eastern National FLF6Gs. Thus emboldened, SBG determined to get rid of the rest of its utterly unloved (and, it has to be said, uncared for) VRs in exchange for Gardner engined FLFs. Among the recipients designated by NBC was United Counties, who cannily sent a Lodekka north of the border, only to have it summarily rejected by virtue of its Bristol powerplant. UCOC thus escaped the fate of some fellow NBC operators, and had no Scottish VRs thrust upon it. Eastern Counties was not so lucky, and ultimately had a total of 33, some being of the particularly troublesome 82 seat VRT/LL6G 33ft long variety. The mechanical condition of all these machines on arrival was atrocious. NGM 157G, a VRT/SL6G, entered service with Central SMT in December 1969, but lasted there only until 1973, when it was despatched with six others of the same type to Eastern Counties. The other Central SMT VRs went to Alder Valley, Lincolnshire, Southern Vectis and United Auto. VR 316 survived to pass into the hands of Cambus in August 1984, when it gained the new number 503. It was ultimately scrapped, date unknown. Astonishingly, four of the former SBG VRs seem to have been preserved, two of them ex ECOC. By coincidence, yesterday I met an enthusiast who was formerly a member of United Automobile’s management. He told me about the arrival of the VRT’s transferred to United from Western SMT. They were collected from Carlisle, and found to be in appalling condition. However they were all overhauled before entering service, and afterwards led full, trouble-free lives with United. Alexander Midland’s fifteen VRT’s were all transferred to Eastern National as part of the exchange scheme, and many of these were eventually transferred to Crosville around 1981/2 following the MAP scheme, which required more double-deckers in rural North Wales. Most of these were allocated to Bangor Depot, but we had SMS 43H at Caernarfon Depot, where it was a great favourite of mine. At first the four speed gearbox seemed an oddity, but despite this the bus performed well and I often drove it on duties which it would not normally have operated; in particular I often took this VR on the "last Llandudno" in preference to the scheduled Olympian; I also often took it on the Porthmadog route and over the Llanberis Pass on the Snowdon Sherpa. I can’t help feeling that the Scottish Bus Group gave up too easily with these buses. Ironic. My CAPTCHA code for this response is 3DMS! Nevertheless, as one of Bristol’s biggest fans the VR was one of my least favourites. I know the LH probably was worse and I’m no lover of any of the 5 cylinder models but the VR suffered from the same disease as many buses which came before and after. It was rushed onto the market with insufficient R & D so it neither had the character of its predecessors nor the good manners and reliability of the RE. One could say, however that the Series IV got it right. Series IV? Well what was the Olympian? A successor which started out as a Bristol and a development of the VR. Not only that. It became a classic and one of the best deckers ever built. What a very interesting link, thanks for posting it. This photo brings back happy memories of Cambridge Rd., ELY, where I grew up, and the depot where my uncle, Walter Long worked for E.C.O.C. as a conductor up until retirement, finishing up at Hills Rd., Cambridge depot. I also worked for them, first as a crew driver, then OMO at Cambridge. One Saturday, a rest day…two of us were sent to Norwich with two LKDs which would barely reach 35 mph in the pouring rain to bring back two Scottish VRs. It was terribly slow progress, but on our return journey, the sun came out, and I for one really enjoyed the drive back. The two VRs were the subject of great interest amongst the drivers, being slightly larger than the ones we already had with a higher seating capacity, and the triangular destination panel. I remember that their livery was yellow, but cannot recall where they were from exactly. It was a very nice piece of overtime, and we all thought that we had got the best of the bargain in the exchange that day. That’s a fascinating article on the SVBM website. Could SBG have persevered with its VRTs and resolved the problems? or was SBG determined to revert to a sort of technological dark-age?? (witness the subsequent preponderance of high-floor/manual gearbox/non-power-assisted SDs … even on Central’s largely urban network). Is Ely depot still open? (presumably it would be Stagecoach now). Roger- this tale and the link are fascinating. The bus we thought was blameless wasn’t: Wulfrunian, Atlantean, VR: can anyone dish the dirt on the Fleetline or did Daimler get it so right when the Roadliner got it so wrong? Then of course Hilditch’s (was it?) Dominator of which we do not speak on this site? SBG did not seem to trust new technology, even if it worked and when it didn’t, well… it also seemed to distrust its drivers. There were of course engineers like this, even perhaps including Donald Stokes whose Triumph Herald could only be described as primitive- a sort of third world concept of basic, accessible engineering: the irony being that these VR’s ended up with Herald bonnet latches. The VR’s I knew had exhaust sounds that any boy-racer would be proud of…and every time one comes up I ask here about those hatches which could have been rear engine Cave Brown Caves but through which you sucked the top-deck fag ends: is that so? did they work? What an essay in political interference, swinging first one way, then the other- and the futility and waste of command economies applied through the grant. The locals think they are in charge, and take the rap for failure… but we pull the financial strings. NHS, Buses, Rail, Education… what else? I was given a Triumph Herald 13/60 by my company on the pretext that the small printing machines we had to demonstrate could be easily slid in and out of the lip-less boot (not to mention the fact that the company was too mean to buy estate cars). When it had to be replaced we ended up with Vauxhall Viva Estates. I know which I preferred, and it wasn’t built in Luton or Ellesmere Port. The Ely garage closed quite many years ago. After closing as an operational garage the forecourt (where the VR in the photo is parked) was used as an outstation location for a while. I only live about 14 miles from Ely but when I do visit I don’t travel along the road where the garage was. I seem to recall the site was where the cluster of newish houses now is to the north of Samuels Way. I can’t recall if the Ely garage site ever got into Stagecoach ownership – it may have been sold under the pre-Stagecoach owned Cambus. When the organisation, I worked for was privatised, company car were instituted for those who travelled a fair amount. It started with Talbot Horizons, with the Tagora for more senior staff. I managed to reject the Tagora because I discovered that they would not allow towing bars to be fitted – it lowered the value, they said, not realising that there was no second-hand value in them to start with! In point of fact, I had no caravan! The next, middle-manager cars were Montegos and I did the same again. Eventually late-model Ford Sierras came along and the excuse of a caravan enabled me to get a 2.0 litre GLX. I never fitted a towbar, though! The seats in it were the most comfortable I’ve ever known, enabling me to drive all day with never an ache! With cars like Talbots and Maestro/Mondeos, it’s no wonder we have no indigenous car industry nowadays! For those who may wish to check out the location, the garage was on the A10- Cambridge Rd., ELY, on the left as you head north, just before the right hand bend where the road becomes St Mary’s St.
Norman has given the location of the Ely depot as I remember it. Back in time, the A10 went right through Ely centre, along Cambridge Road, St Mary’s Street and then Lynn Road, and the bus depot faced directly on to it. I believe that the place did pass into Cambus ownership, but I don’t know when it was pulled down. Sadly, the typical Tilling garage of which Ely was an example, is a rarity nowadays. Turning to Chris’s point, I have to disagree. I’ve driven company cars of several origins, including Ford, Chrysler/Talbot and Vauxhall, and had a 2 litre Montego for my daily 100 mile round journey to/from work whilst at Kentish Bus. In performance, roadholding, reliability and interior space, it beat the Sierra and Cavalier of the Chief Engineer and Company Secretary respectively hands down. When I left, thanks to privatisation, I bought a Maestro. The BL knocking game was utterly childish, and yes, I once had an Allegro, a model that received stupid criticism from people who had never even sat in one. The quartic steering wheel that petrolheads waffle on about disappeared within the first year, and all could be replaced under warranty. The much derided styling foreshadowed the almost universal blobby shapes of present day saloon cars. Our first (1981) Metro lasted 19 years and still passed its MoT when I decided to replace it. Joe, the Herald 13/60 had a flat boot floor. The printing machines weighed 112lbs with more than half the weight on a less than a third of the machine platform so a flat, lip-less boot was essential. As for performance, the car was nippy, had a great turning circle and great visibility with narrow pillars. It also had height adjustable seats. Thanks for the information about Ely depot: as I get progressively less interested in current operations its the relics of times past that increasingly interest me. I used to aspire to owning a new Montego, being a quality (well in my opinion – and a step up from the Triumph Dolomite/Van den Plas 1750 I was then driving) British-built and British-owned car that I could afford. Now, I’m running Audi and Skoda as there isn’t any British owned and built car within a reasonable price bracket. 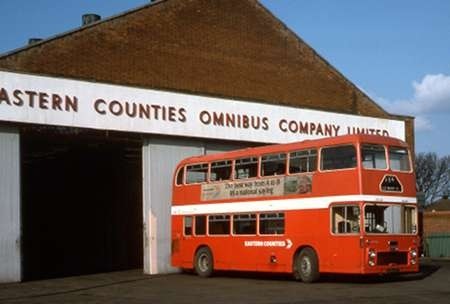 This picture brings back memories, I used to spend a lot of time here as a bus mad school boy and remember the Eastern Counties staff there being very tolerant and patient towards a young enthusiast like myself. Behind the garage on a patch of land they used to park up withdrawn vehicles from Cambridge garage, I remember their last two Bristol RESL being there for ages and also a pair of ex Cambridge FLFs. I remember the ex SBG long VRLLs but by the time I was interested they were all allocated to Norwich depot, never realised how special they were, being more interested in the Bristol Lodekka LFS, FLF and LFL that were still running about at the time. We were unlucky to receive some of the SBG VR,s at Alder Valley in Reading, the union blacked them for a while because of their 4 speed gearboxes claiming they were too slow on the longer routes. When we started receiving mk 2 VR’s some non power assisted ones were fitted with Alder Valley’s own air assisted steering, these were terrible as the steering used to go solid at low speed which did not feel safe. The Mk.3 was a big improvement, nice steering and gearbox especially the very last batch we had with good heaters by your feet at last!